The loanable funds market is like any other market with a supply curve and demand curve along with an equilibrium price and quantity. What makes this market different is the axis labels and the determinants that shift both curves. So drawing it and manipulating it isn’t too difficult if you remember a few key things. The Y axis on a loanable funds market is the real interest rate; abbreviated with a lower case “r”. That means it is the nominal interest rate minus inflation. It is price for taking out a loan. The X axis is the quantity of loanable funds. 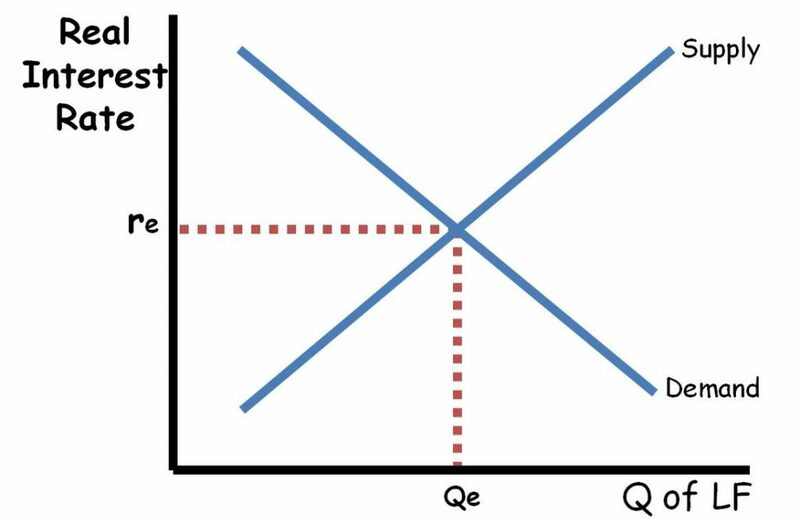 The supply curve is the savings supply and the demand curve is predominantly the demand for investments. 1. Changes in the expected rate of return on investment. This is all there is. Anything that changes the expected rate of return on investment will shift this curve. It could be changes in the economy, tax credits, and bullish or bearish feelings about the economy. Businesses demand more loanable funds when they expect to earn more on the investments they are purchasing with those loans. Note: As mentioned below, shifting the demand or supply with changes in the government deficit or surplus is acceptable on the AP Exam. My advice is to stick with what your teacher taught you. 2. Foreign investment – When foreign investors move their financial capital into a country they increase the supply of loanable funds available. The real interest rate is a primary force in determining economic growth. When interest rates are high, there is a decrease in the quantity of new investment (gross investment). This decreases capital formation and slows economic growth. If there is a decrease in the supply of loanable funds, interest rates rise and a decrease in economic growth will result. On the flip side, when interest rates are low, there is an increase in the quantity of investment and economic growth increases. One tricky aspect of the loanable funds market is that the government deficit (or surplus) impacts the loanable funds market and there are two ways to illustrate that budget impact. One way is to include it in the demand curve. When the government has a deficit, it demands more loans along side private businesses; increasing the demand for loanable funds. When the government has a surplus, it demands fewer loans decreasing the demand for loanable funds. This method makes a lot of sense intuitively. But there is a down side. When the government deficit spends, it generally increases the real interest rate, reducing the quantity of investment (AKA Crowding Out). With this method, the change in equilibrium quantity does not correlate to a change in gross investment. That is, an increase in the budget deficit will increase the equilibrium quantity when it in fact decreases gross investment. The other method for dealing with a change in the government’s budget is to shift the supply curve. The logic behind this method is when the government has a budget surplus, it has savings that add to the savings supply (shifting it to the right). When the government has a budget deficit, it has dis-savings which are subtracted from savings supply (shifting it to the left). In other words, a budget deficit means the government takes some of the savings supply so there is less available for private loans. While this method may be less intuitive, it has the benefit of showing the correct correlation between a change in equilibrium quantity of loanable funds and the change in gross investment. That is, an increase in the in the budget deficit will decrease the equilibrium quantity of loanable funds just as it decreases gross investment. Either method for dealing with a government budget change is perfectly acceptable. I suggest you use the one taught by your teacher or college professor.